Are we Creation of the Universe, or is Consciousness the Real Creator? 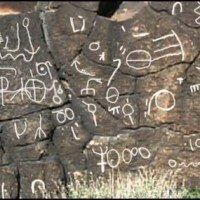 In 2001, Gary Vey, a computer programmer, was asked to do a story on some petroglyphs in a small Colorado town called LaJunta. He photographed them painted with aluminum powder to avoid damaging the writing (it falls off the rock harmlessly when it is dried). About later, he received a mail from a retired professor from BYU, which had some jpg files attached showing more petroglyphs with these same shapes. Vey wrote back to him and asked where in Colorado these photographs were taken. 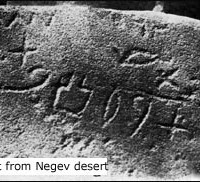 The professor promptly replied, with even more photographs, that they were from the Negev desert in Israel! Thanks to his help, Vey managed to translate some of the characters of LaJunta, which he used, as a computer programmer, to build a small translation program. Returned to Colorado, a few months later, he successfully translated most of the remnant petroglyphs there…. The Colorado writing made references to Cannan and the deity YH (Yahweh)! How could this ancient language be carved on the Colorado stones? Moreover considering they were dated thousands of years ago… (If you want the whole story click here). This discovery is obviously very controversial, since it points to the fact there has been encounters between the men living continents which officially couldn’t be, in absolutely no way, linked 3000 years ago. 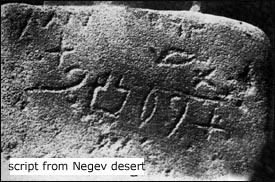 Vey was, for this, compared to Graham Hancock or even worse — the movie, Raiders of the Lost Ark.